A resounding crack echoes through the canyons and across the slickrock expanses of Zion National Park wilderness: somewhere out there, two desert bighorn rams charge one another and clash horns in a spectacular fight for breeding rights. 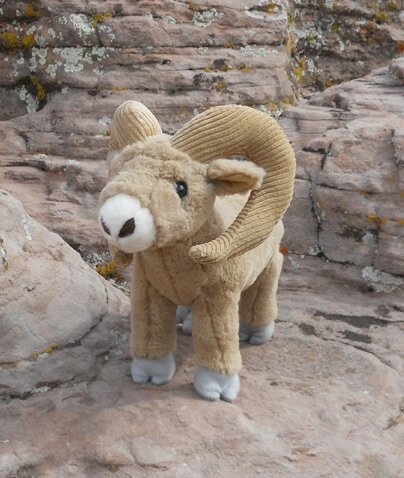 The bighorn plush is made especially for the Zion Adopt-a-Bighorn program. Or…you may opt to receive no premium and have the full donation go to the program. Desert bighorn sheep play a vital role in Zion National Park’s ecosystem as large herbivores and valuable prey for large carnivores, such as mountain lions. Bighorn are sometimes called “wilderness species” because they inhabit some of the most remote and stunning environments in the West. Two rams charging head-on in a clash for breeding rights is one of nature’s most spectacular sights and can be heard from miles away. Today, Zion visitors may be lucky enough to see a bighorn in Zion, but this has not always been the case. Their history is a tumultuous one. Zion has long been home to bighorn, for they are well-depicted in prehistoric petroglyphs and were often seen in the early days of European settlement. However, combined stresses from human settlement led to their extinction in Zion during the 1950’s. 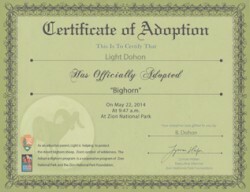 An intensive reintroduction program in the 1970’s re-established 12 bighorn in the park. Despite the odds, the Zion population has prospered. Today the population is estimated to be over 150 individuals. Be part of a lasting legacy for many generations. 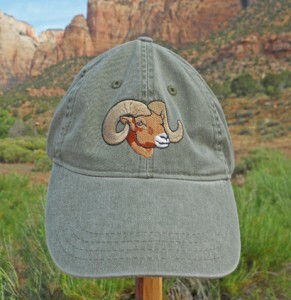 All program proceeds go directly toward bighorn research in Zion National Park. Adopt today!